Lately a video shared via a Facebook Indigo group caught my eye. A hilarious Japanese woman was shown using salt as a tool to extract color from a Japanese Indigo variety with apparent success. I’ve dubbed it the Indigo Salt Rub method. I’ve never seen it written up anywhere in historic literature. Here’s that video link! I claim no credit but just sharing the info…Enjoy. Skip the ad! For those who speak Japanese here ya go, please let me know in the comments if you glean more info if you read thru the blog. Here is the website, it looks like the gallery has a blog where more info is embedded. My experiments are below, a reminder that this works with this species of Japanese Indigo because of the beta enzyme that causes the indigo to bind with the protein fiber. It is a short-lived enzyme so one must work the material quickly before the benefit dissipates with exposure to oxygen. In October I decided to give indigo salt rub a try as demonstrated above and also add a twist with my dried Japanese Indigo. I don’t have much fresh indigo this year due to the strange weather so I thought this would be a noble cause for dried leaf sacrifice. Salt rub with Japanese Indigo does give you a truer blue than the blender method. This was the case with JUST Japanese Indigo as a base rub. It is great for small items where you just want use a few leaves for color. In my case, I harvested to dry my indigo for later use and used the leftover leaves that I stripped off the stalks for hanging for the salt rub method. Keep some silk blanks around to use or some tight spun protein silks that can take the rubbing. Remember the mechanical process is rough on the material. I would not do this with wool. The effort to rub the leaves would most likely felt the wool. The blender method is much more sane. It is not a high production method, it takes time to smash the leaves and rub the color evenly thru the skein. I used ordinary table salt, some folks online have suggested using rock salt for better pressure points to break the leaves down. It appears that the teacher in this video used some type of larger salt crystal. Since I was rubbing silk skein I opted for limited salt impact and more time/muscle. Once I saw how the color took on the straight salt rub I wondered if it would work with my dried indigo. John Marshall in his Singing The Blues covers a method, Cooked Raw Leaf and Enzyme Bath, in his “Singing the Blues” book (p. 27). That method worked nicely if you have a good amount of indigo and need to spread your work over a period of time. So I tried a couple of approaches. Fresh Leaf Indigo Salt Rub – worked as reported, it did take time but yielded a blue. I used 30 grams of fresh leave to my 30 gram silk skein. The color yielded was not as dark as possible only because I was not willing to give up my leaves I am drying for future use. This became my basis for comparison to the next two skeins. Fresh/Dried Leaf Salt Rub – I added 30 grams of dried leaves to 30 grams of fresh leaf and rubbed away. It was not successful. I had hoped that the beta enzyme in the fresh leaf would kick off the dried indigo to bond. 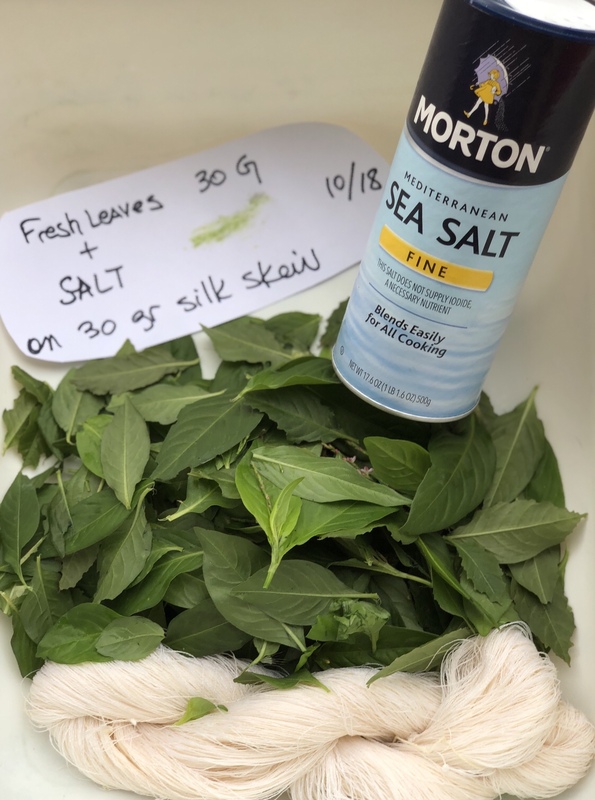 Fresh/Soaked Dried Leaf Salt Rub – keeping in mind that straight dried did not work with the kneading, I tried soaking to soften the leaves. I soaked 30 grams of my dried leaf for a couple of days to break down the cells and added that mush to my fresh leaf mush. This soaking did not yield a darker blue than my control skein. Overall it was fun to try this experiment but in my region I just cannot grow enough Japanese Indigo to take advantage of this rubbing method. And I have taken my fresh leaf and dried leaf remains and formed patties to air dry. I plan to see how these patties work in part 2 of a Rowland Ricketts recipe for extending the use of my leaves after they have been dried. The salt rub method with the Japanese Indigo gave a truer blue than the traditional blender method. The blender method combining both the Indigofera Suffruticosa and the Japanese Indigo provided the best blue for the least effort and use of fresh leaves of methods tried todate.